The topic of tonight’s presidential debate was domestic policy, and citizens all over came to Twitter to share their comments and follow millions of real-time responses from pundits, campaigns, and fellow voters. 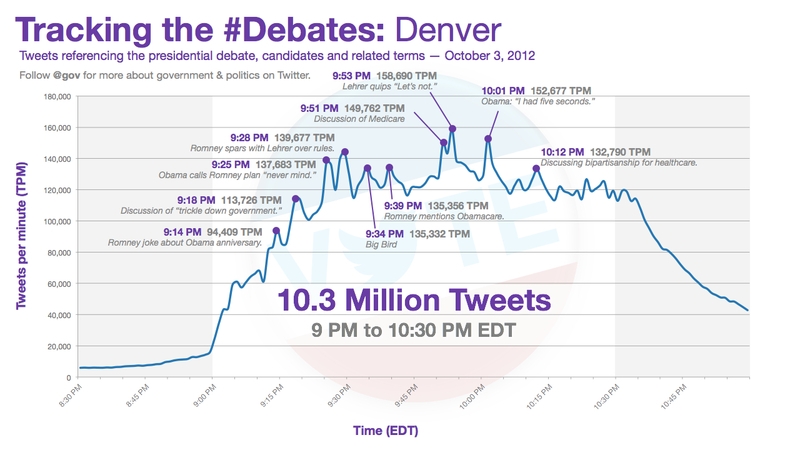 As conversation on the Denver stage and on Twitter ranged from Medicare to Big Bird, there were more than 10 million Tweets this evening, making this first of the 2012 presidential debates the most tweeted-about event in U.S. politics. As the evening proceeded, several other trends emerged on Twitter. While @BarackObama and @MittRomney sparred over details of their respective economic plans, viewers at home attempted to keep up with the statistics and promises from each of them. Several Twitter accounts were dedicated to fact-checking throughout the evening, and fact-checking Tweets saw a great number of of retweets. The candidates weren’t the only lighting rods for conversation: hundreds of thousands of Tweets — and even a new parody account — assessed the evening’s moderator, Jim Lehrer of PBS. Worst part of Jim Lehrer’s moderating was he failed to ask the candidates where they stand on the NBA’s new flopping policy. Of course, the evening’s real breakout star was a certain tall yellow Muppet. There were more than a quarter million Tweets mentioning Big Bird, following Governor Romney’s statement that he wants to cut Federal funding for PBS, the Muppet characters’ TV channel, even despite his stated fondness for the Sesame Street character. Ardent supporters of Big Bird (and public broadcasting) took to Twitter to create parody accounts such as @SadBigBird, @BigBirdRomney and @FiredBigBird. Next stop on this portion of the campaign trail is Danville, Kentucky, where @JoeBiden and @PaulRyanVP meet next Thursday night for the Vice Presidential debate. We’ll meet you on Twitter to take it all in.